If you couldn’t piece together our cryptic teaser.. We are having another party with Ruffeo Hearts Lil Snotty this Friday, May 13th! 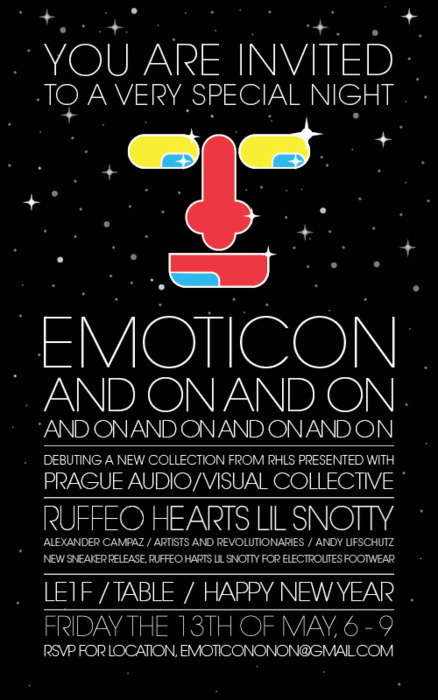 We are super excited to announce the release of the Humanize Master sneaker, the first of the Ruffeo Hearts Lil Snotty for Electrolites Footwear Collection, as well as celebrate the release of the RHLS Emoticon line! Also.. let’s party! The rules are a little different this time — the event will take place at an amazing historic gallery in Manhattan, you need to RSVP by Thursday, May 12th to get in to the party, you will receive the details of the party location when you RSVP, and DOORS CLOSE AT 7! NO EXCEPTIONS! Space is very limited so get on that ASAP. Also, there is security and a metal detector so leave your piece at home. Thanks for partaking in the partaying!